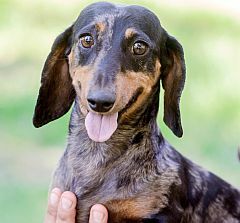 The dachshund, or teckel, or worshond, to give it another name, originated in Germany, where they were bred to hunt badger and fox. The small dogs were able to get right into the animal's hole and flush it out. They have big paws for digging. They are great burrowers, and like to burrow into a pile of blankets - or burrow through a hole in the fence. Be careful your dog doesn't make a hole in a blanket, or it may get its head stuck and strangle itself. Different colours are illustrated at the foot of this page. Sharron Brown 0828307291, email: Sharron@dogsdogsdogs.co.za Webpage: Conkasha. Barbara Brown 082 255 1635 email: barbarabrown@telkomsa.net, Webpage: Simaxdal. Barbara Brown, email: 082 255 1635 barbarabrown@telkomsa.net, Webpage: Simaxdal. Your dachshund puppies could go here! In South Africa, the name of the breed is usually pronounced dash-und. (und as in under) But it sometimes sounds like Dutch hound! Some folk call them "Daxie" or Daxies" as it's easier to say and spell than dachshund. 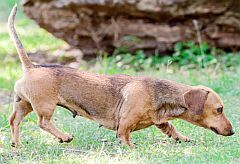 Dachshunds have short legs and long, sausage shaped bodies, which has given rise to the nickname, "sausage dog", or in Afrikaans, "worshond." 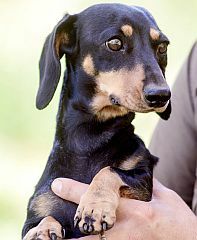 The correct name for the breed is "dachshund." The coat can be smooth, long, or wire-haired. The long haired dog needs a little brushing to keep him at his best. 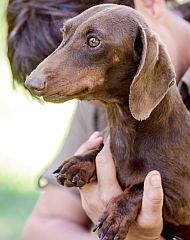 Long haired Dachshunds have a wavy, silky coat. 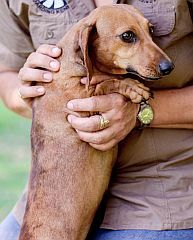 Dachshunds are popular in South Africa as they fit in well in a town house, or any household. It's not advisable to carry puppies around all day, as they need to use their legs in order to develop properly. Breeds with long spines can develop spinal trouble, so do be careful about handling your puppy. Use two hands to support the pup. They should not be allowed to jump down from heights in case they jar the spine. As well as there being different coat types, there are two sizes as well! A dachshund may be miniature, weighing up to 5 kg, or standard, weighing from 9 to 12 kg. 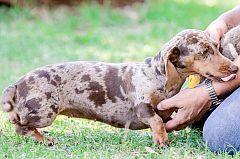 Dachshunds make friendly, confident pets. Colour: Usually chestnut, or brown & black, or brindle, but there are many other combinations. Miniature long hair dachshunds belonging to W. Davies. Colours left to rt: shaded red, silver dapple, black & tan, silver dapple. 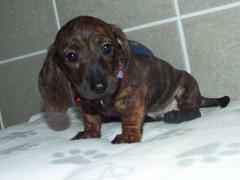 Dachshunds are small dogs, but they have big hearts. I'm sure God, the Creator of dogs, loves ALL dogs, small and great. As the Bible says, "Praise our God, all his servants and you that fear him, both small and great!"